Heaton Champion de Crespigny was born in 1796 in Wiltshire, the seventh child of William Champion de Crespigny (1765-1829) and Lady Sarah Champion de Crespigny née Windsor, daughter of the 4th Earl of Plymouth. He was my second cousin five times removed. 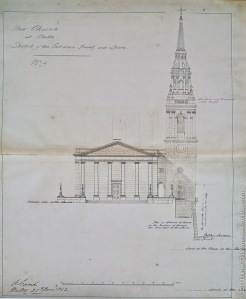 In 1820 Heaton, the second surviving son of Sir William Champion de Crespigny, married Caroline, daughter of the Bishop of Norwich, at Norwich. 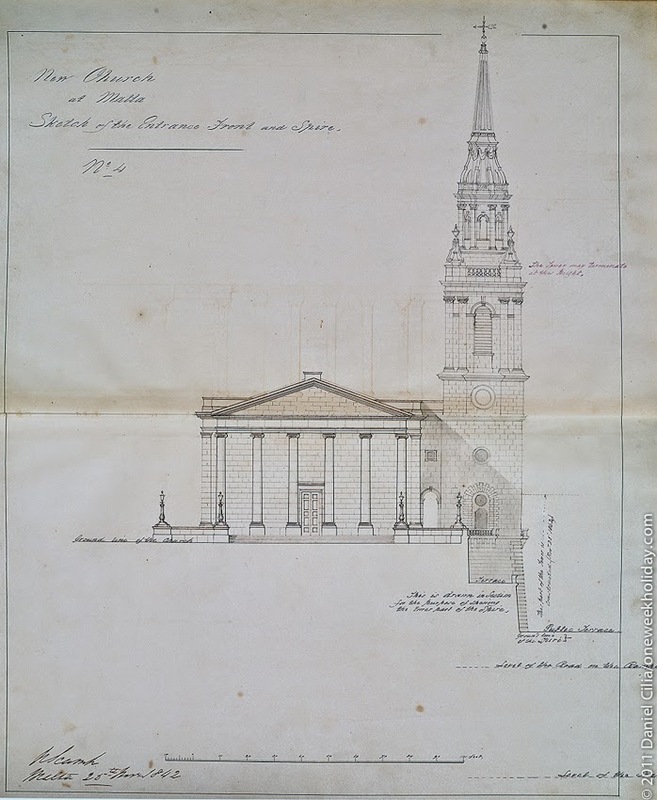 At the time of his ordination Heaton had not yet graduated from Cambridge. In April 1822, Heaton’s father-in-law, arranged for him to obtain the living of Neatishead in Norfolk. 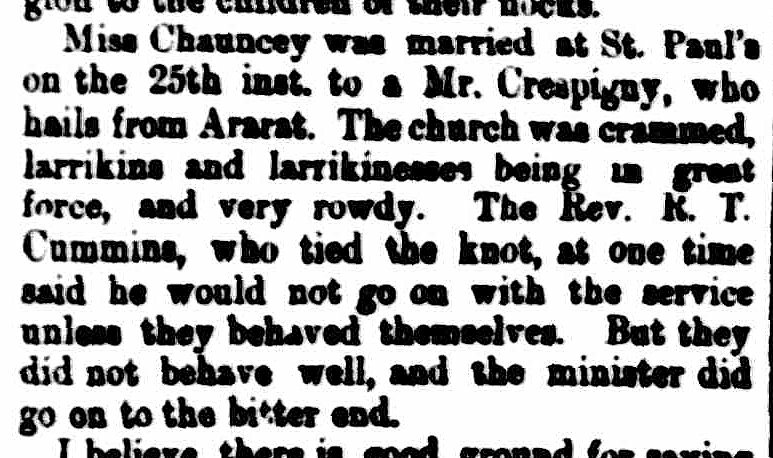 This was reported by the Norwich and Bury Post of 8 May 1822. The Rev. Heaton Champion de Crespigny has been Collated by the Bishop of Norwich to the Vicarage of Neatishead, in this county, vacated by the death of the Rev. A. Barwick. Heaton was also appointed Rector of Stoke Doyle, Northamptonshire. 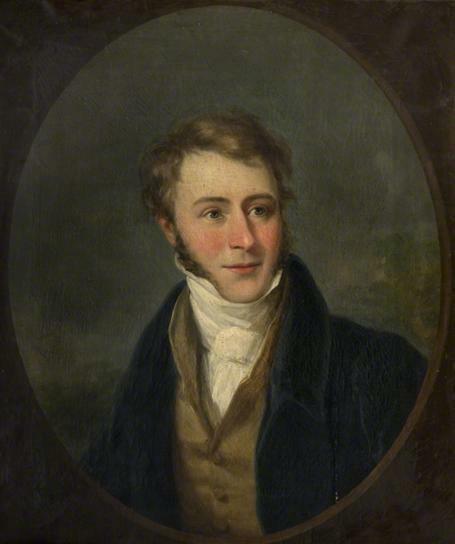 In 1828 Heaton fought a duel with Mr Long Wellesley, who had allegedly defamed Heaton’s father. The matter later went to court, which found against Long Wellesley. Heaton’s role in the affair was not to his credit. Later in 1828 Heaton attempted to blackmail his cousin the Earl of Plymouth. That story will have to wait for another post. 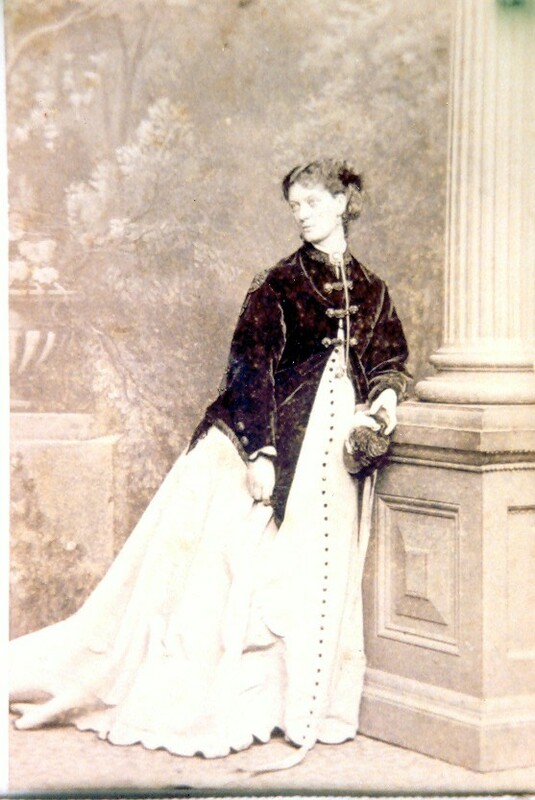 In 1895 my great-great-grandmother, Ellen Jane Cavenagh-Mainwaring (1845-1920), wife of Wentworth Cavenagh-Mainwaring (1822-1895), was widowed at the age of 49. Of their ten children, six were daughters and five of these were unmarried. She saw all of them married before she died, even the youngest, Kiddie. Ellen and her daughters were all born in Australia. In 1891 the family moved to England and lived at Southsea near Portsmouth when Ellen inherited the Whitmore estate in Staffordshire after the death of her brother Frederick (1859-1891). The estate was leased, hence The Cavenagh-Mainwaring family could not live there until the lease expired. This Jane Austen view of a bevy of girls needing husbands, on the marriage market, provides a misleading image of the Cavenagh-Mainwaring daughters. When the Cavenagh-Mainwaring women married they were not young. Eva married at the age 25 to a 41-year-old lieutenant, not a successful career officer. My great grandmother Kathleen was 27 when she married. Helen was 25 when she married, Mabel was 37, Alice was 33 and Gertrude was 37. 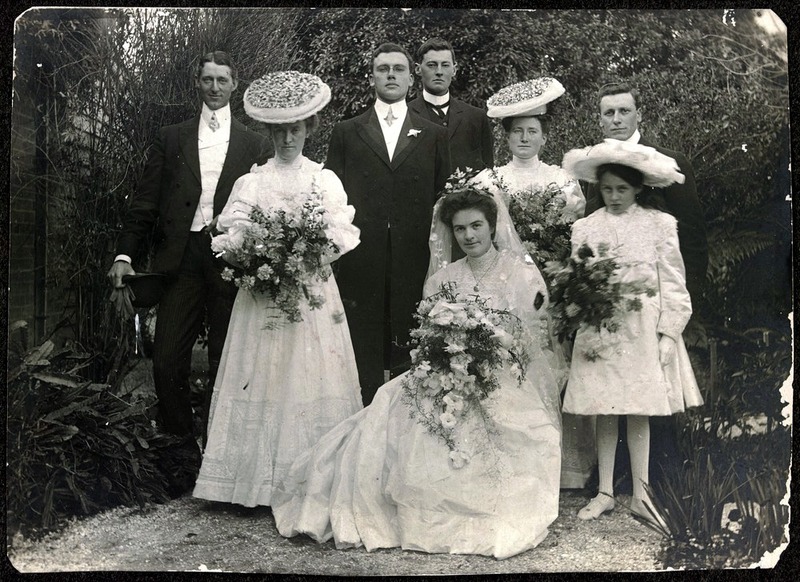 Perhaps their colonial Australian background hindered their marriage prospects, perhaps they were not interested marrying as quickly as possible, perhaps not all Victorian women married young and our assumptions are wrong about this aspect of Victorian life. In September 1892 Herbert J. Gedge was appointed lieutenant and joined the Agamemnon. (“Naval & Military Intelligence.” Times [London, England] 24 Sept. 1892: 6. 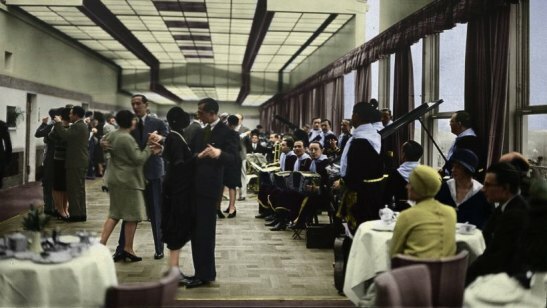 The Times Digital Archive. Web. 14 Apr. 2014.) 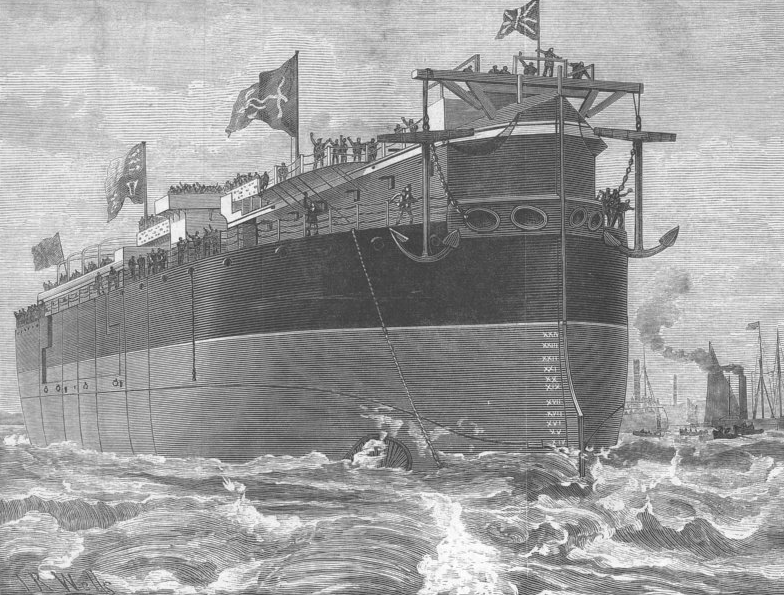 He retired from the Navy as captain on 3 May 1904. (1912 Navy List page 645) He became an adviser in Egypt with the title of Pasha, a title denoting high rank or office. In 1913 Herbert Gedge died in Alexandria, Egypt. 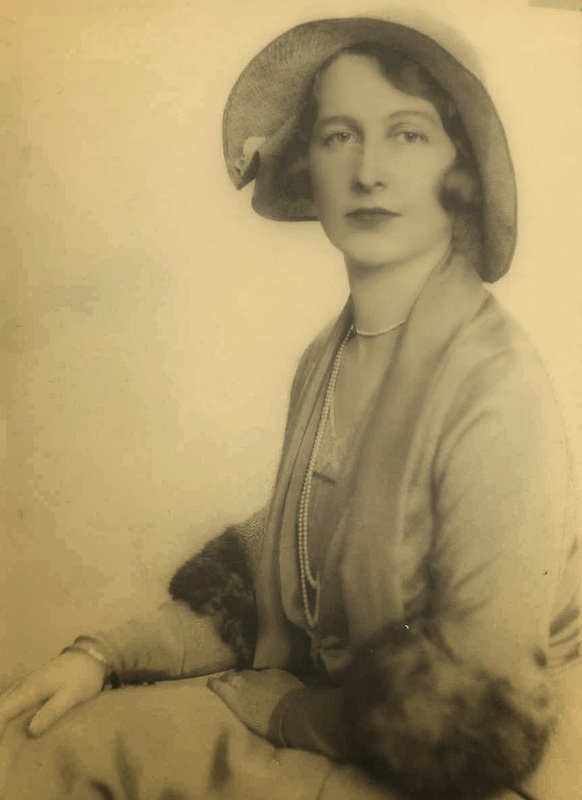 Eva and Herbert had two children: Norah (1894-1971 and Edward 1895-1991). 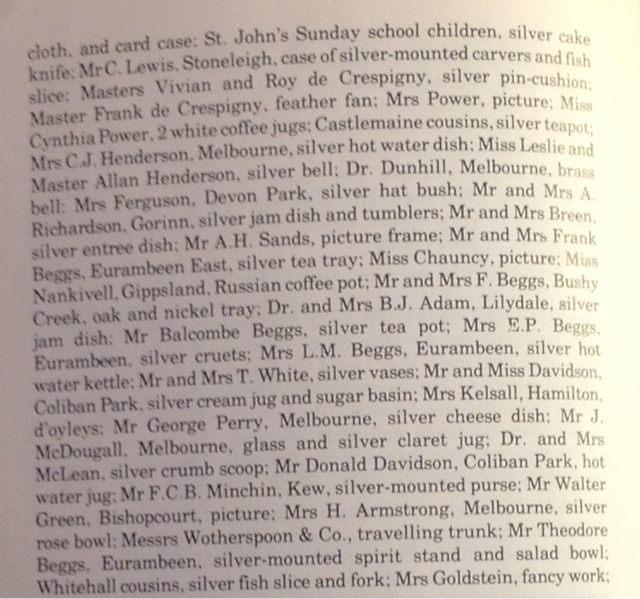 Kathleen, my great grandmother, married Arthur Murray Cudmore (1870-1951) in Melbourne, Australia in 1901. He was the only husband of these six daughters who was not in the navy. He was a doctor, a colleague of Kathleen’s brother Wentworth. Arthur would have known the Mainwarings in Adelaide, South Australia. He went to England to study. 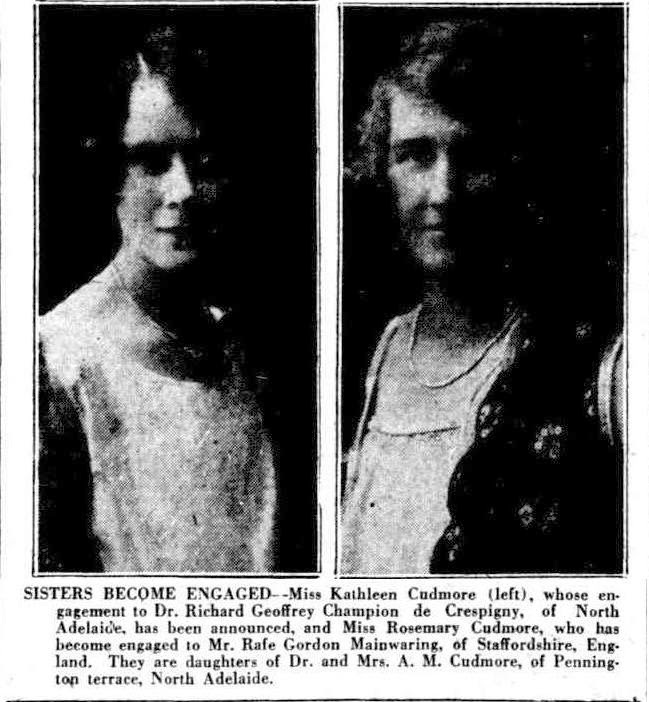 The Cudmores had two daughters, Rosemary (1904-1987) and Kathleen (1908-1913). 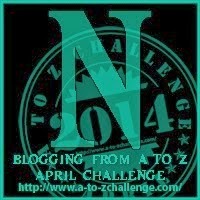 In 1902 Helen, known as Nellie, married Thompson Horatio Millett (1870-1920) in Hampshire. Helen died in 1918 and Thompson in 1920. They had had three children, Hugh (1903-1968) and Guy (1907-1978), and a third child, who died in infancy. “Deaths.” Times [London, England] 14 Apr. 1920: 1. The Times Digital Archive. Web. 14 Apr. 2014. Mabel married Owen Francis Gillett (1863-1938) on 16 April 1906 at St Paul’s Church, Valletta, Malta. “Marriages.” Times [London, England] 23 Apr. 1906: 1. The Times Digital Archive. Web. 14 Apr. 2014. Mabel and Owen had two children, Michael (1907-1971) and Anne (1911-?). 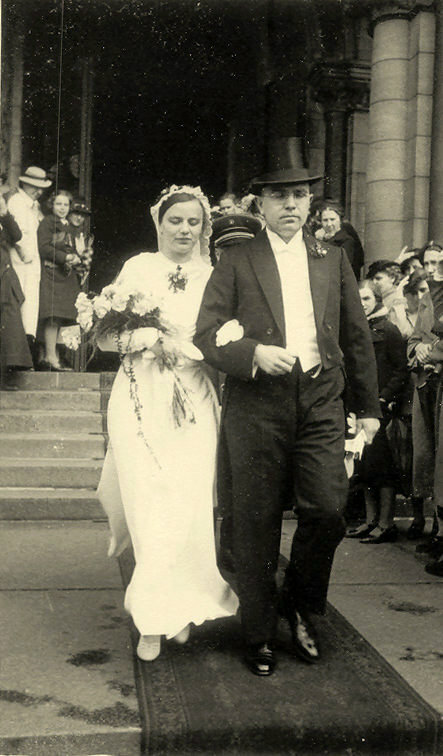 Alice, known as Queenie, married William Edward Blackwood Magee (1886-1981) on 14 August 1913 at St Simons, Southsea. 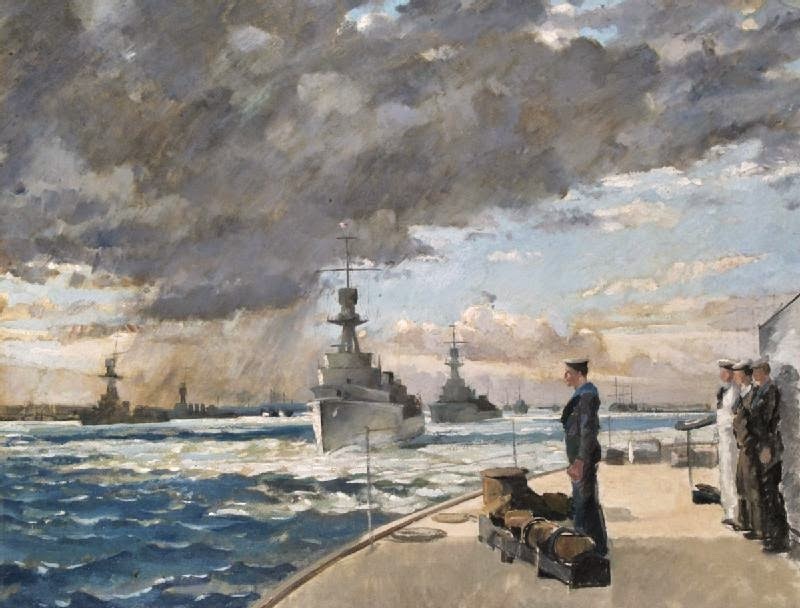 In 1917 and again in 1918, as Lieutenant Commander, William Magee was mentioned in despatches as part of the honours for the Destroyers of the Harwich Force. ( London Gazette 22 June 1917 and Edinburgh Gazette 25 February 1919) In 1920, for services in the Baltic in 1919, Lieut.-Cdr. William Edward Blackwood Magee, R.N. was made Companion of the Distinguished Service Order, for distinguished services in command of H.M.S. “Watchman.”. (Edinburgh Gazette 10 March 1920) In 1945 Captain (Commodore second class, R.N.R.) William Edward Blackwood Magee, D.S.O., R.N. (Ret. ), was appointed Commander of the Military Division of the Order of the British Empire for Distinguished Service in the War in Europe. (London Gazette 7 December 1945) William Edward Blackwood Magee became a Captain in 1929. (1939 Navy List). Alice and William had two children, Richard (1915-1937) and Jean (1917-1996). Gertrude, known as Kiddie, married Edward Morden Bennett (1878-1941) on 30 April 1919 at St Thomas’s Church, Portsmouth. In January 1919 Commander Edward Morden Bennett, R.N. was made Officer of the Military Division of the Order of the British Empire. (London Gazette 1 January 1919) At the time of his death he held the rank of Captain. “Deaths.” Times [London, England] 28 Apr. 1941: 1. The Times Digital Archive. Web. 15 Apr. 2014. 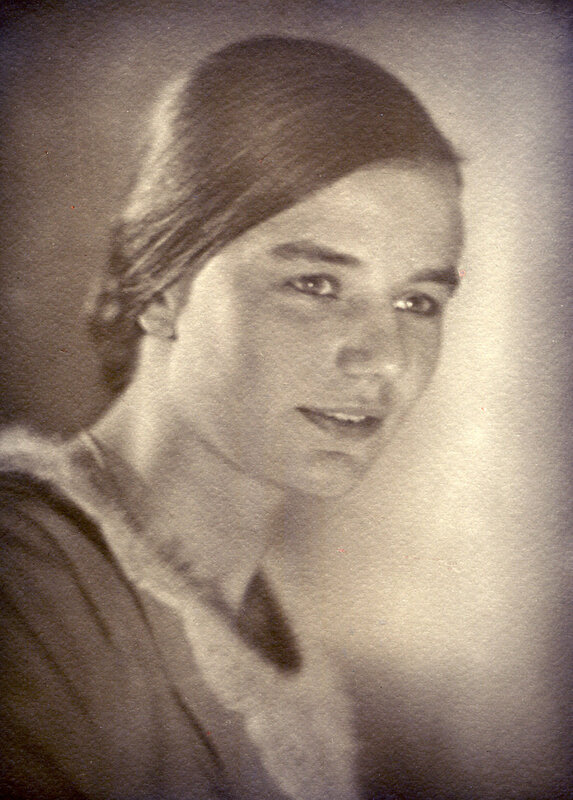 Kiddie and Edward had one daughter, Jean (1921-2009). The six daughters of Ellen Jane Cavenagh-Mainwaring had a very different experience of marriage and motherhood to that of their mother. 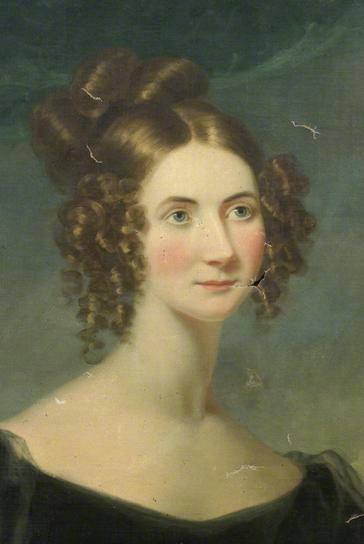 Ellen Jane married aged 19 and had ten children. Her daughters were aged between 25 and 37 when they married and had none of them had more than three children. In composing this blog post I have realised how little I know about young women 100 years ago and my great grandmother and her sisters. I am unable to assess whether they were eager to be married or content to wait until the right person was there. I suspect they were financially able not to marry. 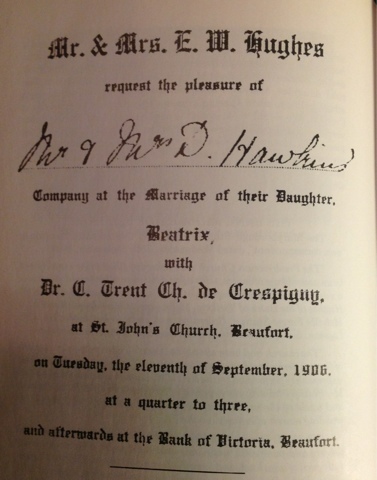 Perhaps there was pressure on the youngest daughter not to marry and keep her mother company. Rosemary Cudmore (1904 – 1987) was the older sister of my grandmother Kathleen. Rosemary married her cousin, Rafe Cavenagh-Mainwaring (1906 – 1995). 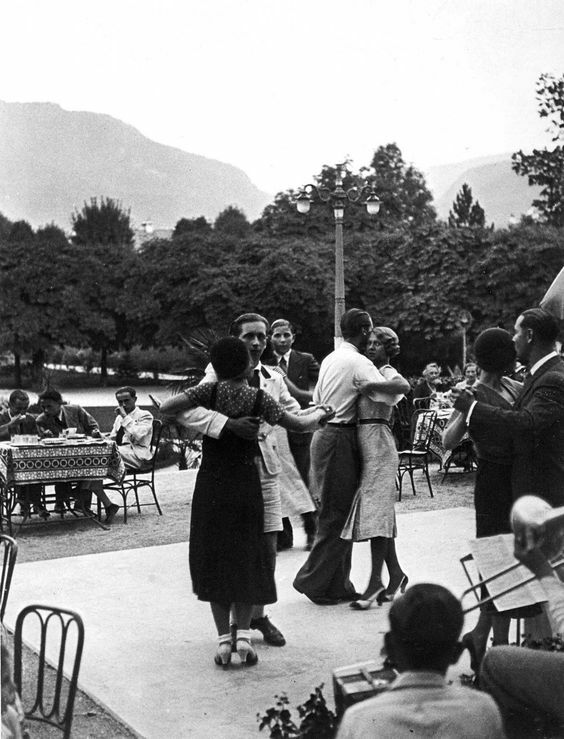 This is Rosemary in the early 1930s. She’s dressed in what’s possibly her wedding outfit. 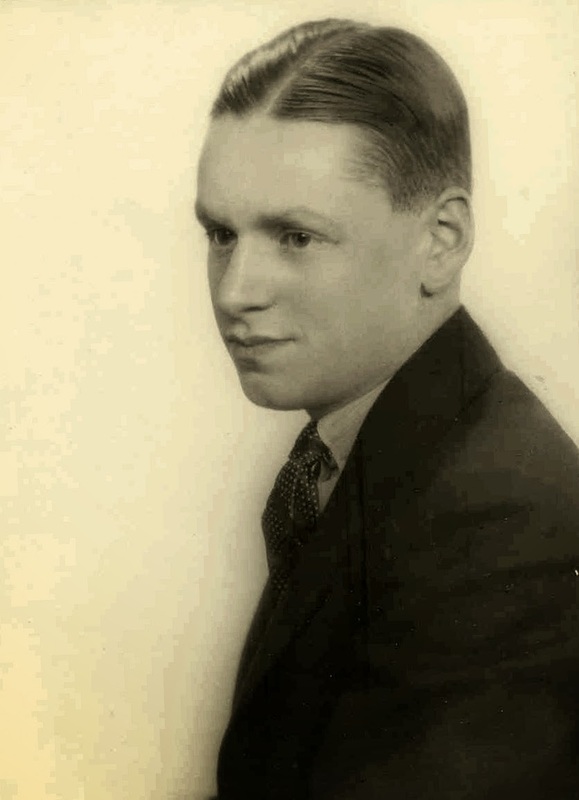 Rafe, also from the early 1930s. In 1891, one hundred and twelve years ago, my great-great-grandfather, Philip de Crespigny (1850-1927) married Sophia Beggs (1870 – 1936). 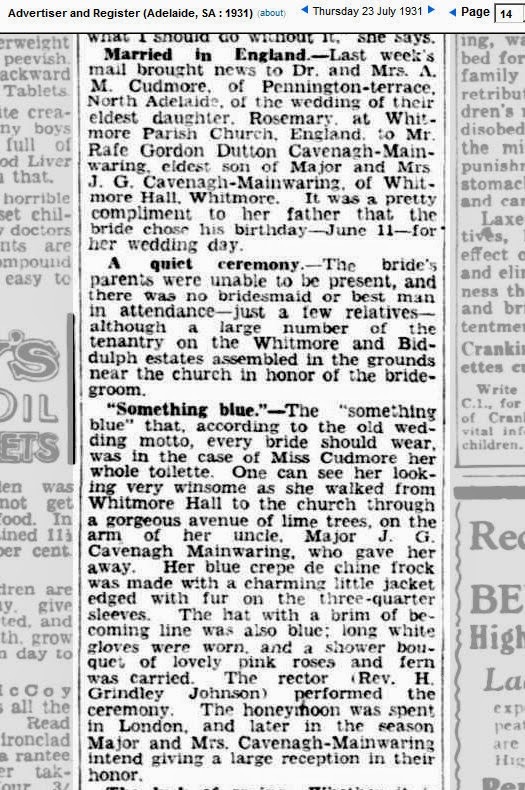 This news item was reproduced in the Euroa Advertiser of 13 November, with the bride’s surname given correctly as Beggs. 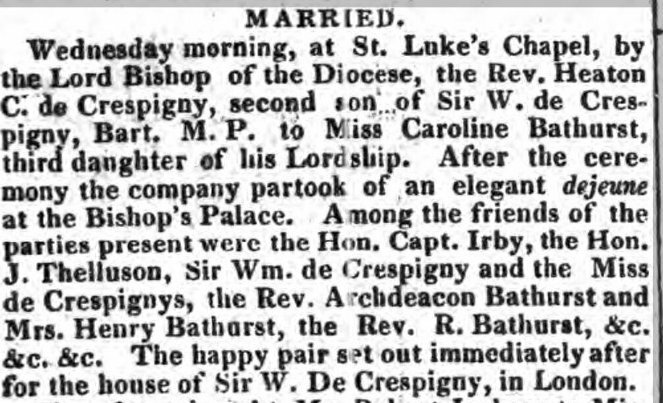 His marriage to Sophia Beggs was Philip de Crespigny’s second, and this wedding seems a little more sedate than his first. In 1883 Philip’s first wife, Annie Frances née Chauncy, had died at the age of twenty-five, leaving him with two young boys: Philip born 1879 and Constantine Trent (then called Con) born 1882. At the time of her death, Philip and Annie had been married for little more than five years. In March 1889 P. C. Crespigny was manager of the South Melbourne Branch of the Bank of Victoria. He had previously served at Queenscliff (where Annie Frances had died ) and Epsom near Bendigo (where his son Philip was born). By August 1890 he had been promoted to Assistant Inspector of Branches for the bank, and went on to become General Manager in 1916. Sophia Beggs was the cousin of Philip’s brother-in-law, Frank Beggs (1850 – 1921), who had married Rose de Crespigny (1858 – 1937) in 1876. My great grandparents Constantine Trent Champion de Crespigny (1882 – 1952) and Beatrix Hughes (1884 -1943) were married 107 years ago today. 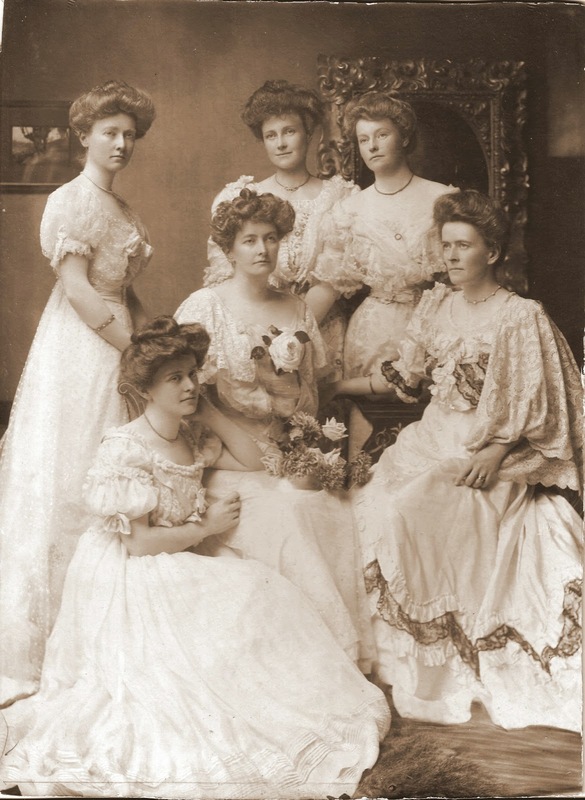 When looking at the material on Vida Goldstein yesterday, I noticed that a wedding picture was included in the collection donated by Leslie Henderson who was the young bridesmaid. 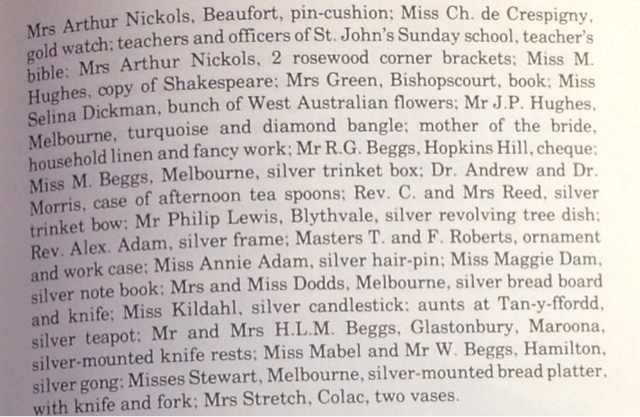 The other attendants were Miss Edith Minchin (Beaufort) and Miss M. L. Hamilton (Ballarat). 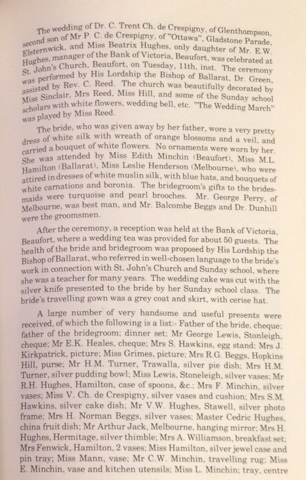 Mr George Perry, of Melbourne, was best man, and Mr Balcombe Beggs and Dr. Dunhill were the groomsmen.